In addition to his clinical role as a podiatrist, Dr. Yorath has served as Medical Director of Rosalind Franklin University Health System since 2007. He is also the Residency Program Director for Advocate Illinois Masonic Medical Center – Podiatric Medicine and Surgery (with reconstructive rear foot and ankle surgery). 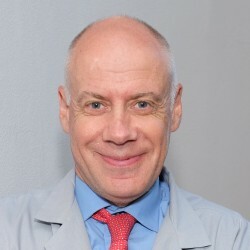 He holds memberships with the American Podiatric Medical Association and Illinois Podiatric Medical Association, and is a Fellow of the American College of Foot and Ankle Surgeons, the American College of Podiatric Medicine, and the Royal Society of Medicine – United Kingdom. Dr. Yorath welcomes new patients of all ages. Dr. Yorath’s scope of practice covers all foot and ankle problems. He utilizes both conservative and surgical methods, from simple techniques to sophisticated surgical reconstructive procedures. He welcomes patients experiencing diabetic complications into his practice.